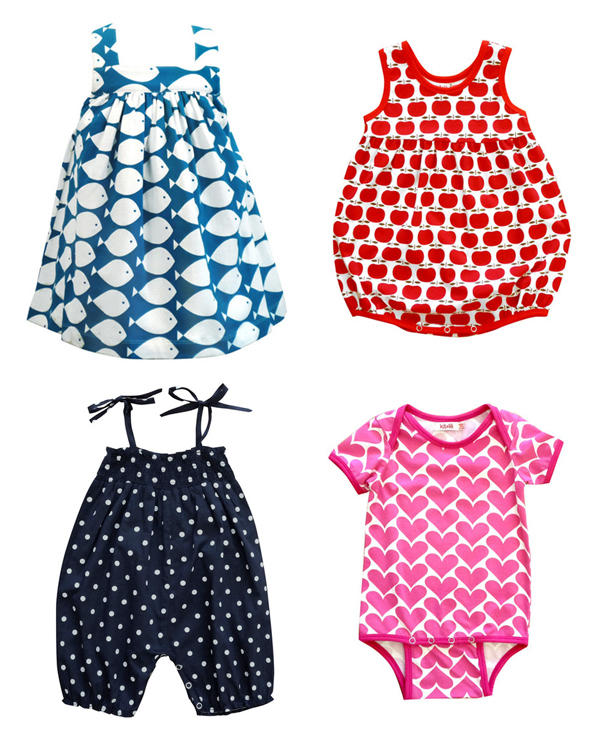 Crushing on the new fun bold and graphic kid's clothing designs from Kit + Lili. That apple and fish print ... so cute! LOVE that fish print!!! now i wish they made boy's clothes! soooo cute. love the apple romper, so cute. the fish dress is the best!! i love all their designs. i gave the heart onesie to my niece for valentine's day. cutie, cute, cute!!!! Your blog makes me smile! Always love the goodies you post. keep it up! Just saw their darling things in a store here. So adorable! super cute, great colours and styles. oh if only i had a niece to spoil with these! oh how adorable... my girly girl is 6 now! I so love girl baby clothes. i want a baby girl just so i can put her in these clothes!! oh gosh, gross imagery but my ovaries just lurched with "WANT!" wish i had a daughter to throw in one of these adorable pieces.